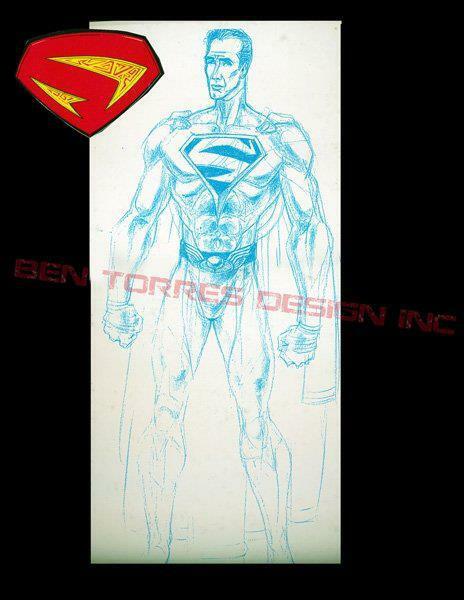 Over at the Superman: Man of Steel (2013) Facebook Page, they have uploaded some never-before-seen concept art by Hasbro. 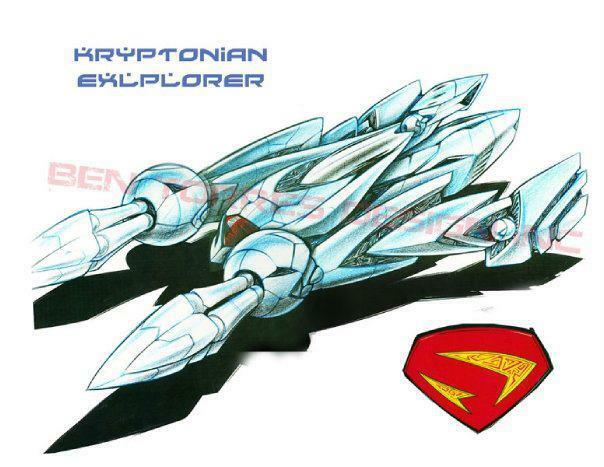 The art shows some of the concepts for the toys that would have been released for the failed (thankfully) Superman Lives movie. For those that don’t remember, Superman Lives was to be directed by Tim Burton and Nicholas Cage was set to play Superman in a story which would chronicle a death a rebirth of the Man of Steel. The story went through numerous screen writers (including Kevin Smith) before being put out of its misery. 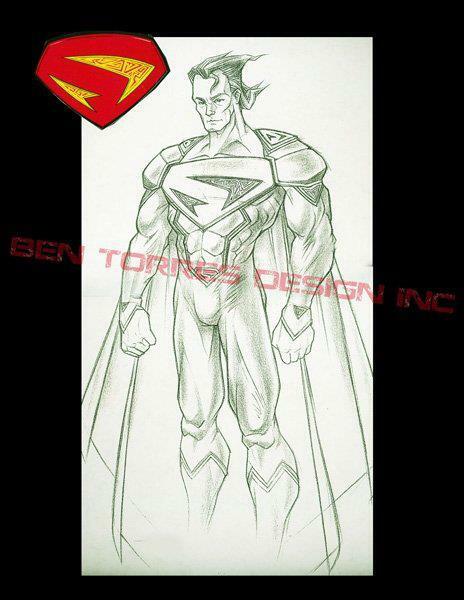 Thank you to Ben and Brian, who were product designers with Hasbro Toys Group, they’ve shared the artwork for the cancelled movie project “Superman Lives.” It’s great to see this part of Superman history revealed a bit more for the fans! 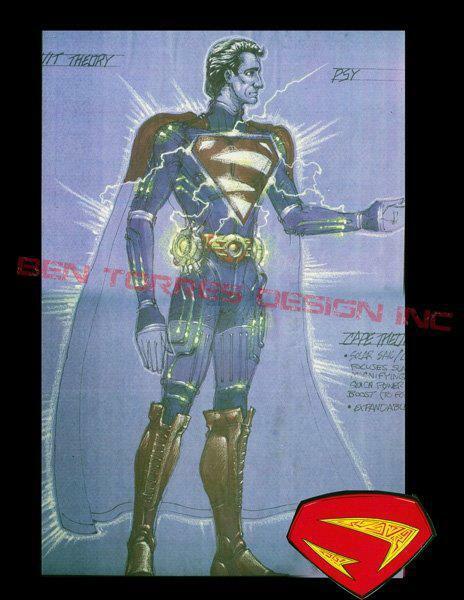 Aside from the well circulated image of the black suit with the small S/, these were other concepts developed both the movie and toy line platforms. 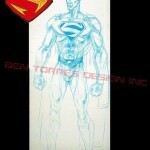 Kind of reminds me of the new 52 Superman's outfit. The suit, and Nick Cage are full of fail as is. I like Nick better as Johnny Blaze anyway. Still, I'm not so sure what they finally did give us was any better than what got scrapped. 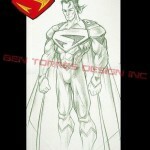 I'm a fan of Superman Returns, so I was happy with what we got. I understand the failings people had with it. However, to me, it was enjoyable. I have also read 3 of the scripts that were to be produced, including the Kevin Smith script. "Yikes" is all that came to mind. I would be interested in seeing a Superman movie with Nick Cage as Superman. Nick Cage makes movies better IMO. Having never read the early treatments, I'll have to take your word for it. But yeah, not a fan of Superman Returns. Still, on the whole I can say I liked it better than Superman III or IV. Well, except for the scenes in III with Richard Pryor. 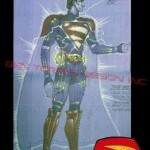 I'm actually surprise that Hasbro was designing doesn't Mattel own the rights to making DC figures? The Kevin Smith treatment is especially easy to find, as is the JJ Abrams one. Most script sites have them handy. In the 90's, Hasbro was producing DC figures. Ah ok thanks. So this goes way back, very nice than. This was directly after the Tim Burton Batman film's in 1989 and 1992. WB wanted Burton to reboot Superman as a gritty hero akin to his take on Batman. But the results were disastrous from the start with the hiring of Nic Cage, to the wacky costume redesigns to the idea of killing him off and bringing him back to life. If they had chosen someone other than Cage for the role of Superman, I would have bee interested in seeing this come to fruition. 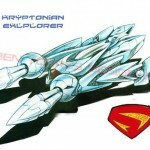 The "Kryptonian explorer" would have made for an interesting toy vehicle, imho, and some of the suits would have been interesting to see in toy-form. ...to the idea of killing him off and bringing him back to life. Haven't they since then killed him and brought him back to life? (in one of the animated movies, haven't seen it, but I've heard some things about it). The whole idea of killing him off and bringing him back (in the movie) stemmed from the Death and Return of Superman storyline that was running in the comics. However, one of the running ideas for Burton's movie was to have him die somehow and be reborn through Lois Lane (Virgin Mary style) and have him grow up in minutes to become Superman again. And the animated Superman/Doomsday movie is abysmal. Completely bungled that storyline. No... it may have made for a decent toy vehicle, but it was going to be in the movie. The people who down Returns as being as bad, if not worse than what was cancelled really have no working knowledge of what we almost got. Burton hated the idea of Superman being an alien. And being able to fly. 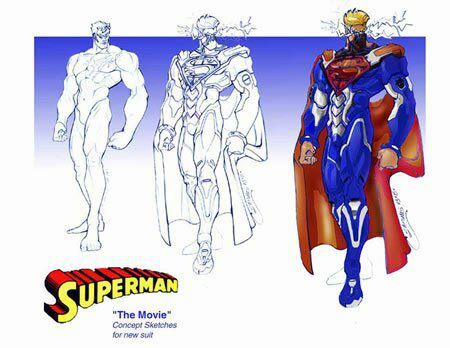 So his Superman couldn't fly, he had no invincibility... he was going to wear a suit that gave him super strength at some point... which also made him look skinless and revealed the details of the sinew in his muscles (Moreso than the GL movie). Because he couldn't fly, he was going to have a "supercar" which sped him around where he needed to be, and he was going to rely on gadgets to do the bulk of his fighting for him. Among the rejected details of his death and return, when he died he was going to touch Lois' stomach. And when he died, she would become pregnant... with him. When he was born through her, he'd grow up really fast, like within days. Burtan honestly hated Superman, wanted nothing to do with the original, and cared nothing for this project except as an ego train. Brett Ratner's stint in keeping it in developement hell wasn't much better. Superman Returns wasn't the greatest movie ever, but it was far from the worst Superman movie we've gotten, and it's a hell of a lot better than most of the rejected ideas of what could have been. My speculation is that WB was so invested in Superman at this point, given all it's years in developement hell, that they wouldn't allow a clean break and a reboot, yet. Singer was limited in what he could do, and pretty much had to pick up the best scraps of what existed before he came aboard. One thing I do remember for certain, is that they refused to allow for a complete reboot, like they did with Batman Begins. But one thing Superman Returns did, is cleared the way for future, better Superman movies to come. Whether they pick up after Superman IV, or Returns... or start from scratch (Which is the rumor, and what I hope. Was never a fan of the Reeves movies). I'm personally thankful that Superman Returns was a hell of a lot better than the failed Superman V.
The problem with the Superman/Doomsday movie I feel, is it really needed to be two full length movies (if not sa trilogy), instead of trying to cram several years worth of storyline into one slightly longer than an hour movie. Pretty sure that's what I said, regarding my working knowledge of the "Superman Lives" scripts. Anyway, thanks to you and Joe for the breakdown. That alone makes me appreciate Superman Returns more. Still don't like the movie for certain reasons I won't get into here (maybe a different thread? ), but I can accept it as the best they could do at the time. I'm definitely with you on a total reboot a la Batman Begins, though. Also, the upcoming Man of Steel from Zack Snyder is a total reboot. It will have nothing to do with any of the previous films and won't even be using the John Williams theme. Reborn? That sounds a bit much, even for a comic! I get that. I was making the comment that, if the move had been made, it would have made for a cool toy, despite how ridiculous it would have looked on-screen. As for how the movie would have turned out if it had been made, the more I read, the happier I am that it got canned. Also helps that I like Returns. It's not perfect, but it's much better than what Burton and them had in the works. Superman dying and coming back is a bit of a stretch for me normally (I also find the main hero dying, or appearing to die, and coming back is vastly overused), but add in Lois giving birth to him...and it's absolutely ridiculous. Burton's take on Superman sounds interesting. I kinda wish they had made it now. I disagree that Superman IV was bad. I think that it was an entertaining movie, and I probably enjoyed it more than Returns. Superman 3 was the best of the bunch though. 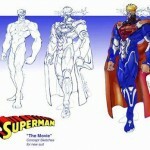 dont know who this guy is but his concept art stinks. There was ni Superman five. As it was Im surprised the universe didnt collapse in on itself when they put John Cryer in a superhero movie. I love Supernan\Doomsday. probably helps that I never read the book. Tim Burton is why Superman Returns failed, Burton, Cage and smith had guaranteed contracts snd got millions. All the expenses of which got added to the project total and finally the tally for superman returns. By itself it made $100+ in profit but with the Burton baggage needed to make $500 milliion ti break even. So glad we never got this made. Too bad we got Superman Returns.